This is just a short Thank You for your prayers, encouragement, and support for the blessings that MSM was able to be part of in 2018 to the children and communities in Uganda and Kenya at the Child Redeemed Mission Home, Promise Primary, and Lord’s Servants Home. It was a full and successful year moving over 300 kids toward a positive future while giving Jesus Christ the glory in the communities. MSM simply passes on the blessings it is brought by you all. We are not sponsored or supported by any other organization, just a lot of loving individuals. Please pray for the two MSM teams that are going to serve at the sites in January. God’s provisions, plans, and protection are needed. If you feel led to be involved and can help with a year end donation, it will be greatly appreciated and used well. Either check or PayPal works. Thank you! Here are some of the kids wearing their Christmas blessings this year….. It is an incredible and humbling feeling knowing that a human’s future is going to brighten and change by walking in the front gate! Twenty children have been forwarded to the Child Redeemed Home in Uganda for admittance because their situation is extremely vulnerable. Risks posed by abuse, malnutrition, disease, and poor care are typical. Most of them need medical care and to be registered in school. They all need security, healthy lifestyle, to be loved and given a sense of worth, and hope for a life fulfilling God’s purpose for them. They are innocent and had nothing to do with creating their tenuous situation. 17 of the 40 children being cared for at CRM are now boarded in High School or Trade School and spend much of their school break time with their extended families. CRM is ready to receive new children. Children that need to join CRM in order to thrive. Mission Servants Ministry fully funds CRM and provides this opportunity completely through donations, sponsors, and God’s providence. Please Prayerfully Consider Joining in a Hands-On effort…. “it’s God’s Grace to see instant security, love, and hope for a real future in a Child’s Life”…..and Sponsor one! $50.00 per month supports a child completely…food, clothing, school. Unlike the large Child Funds, we have only one sponsor per child and encourage a relationship. 100% of sponsorship funds go to direct child support at the home. Here is a summary of what we are planning…..
Evening boys and girls meetings with spiritual and practical focus. Focus on new children to acclimate and get to know. Security lights covering the chickens. Extend 24 V power from the well area light pole, mount lights. Install gutters on end of dorms near Dining Hall to eliminate damage to concrete. Implement 3 more solar panels and batteries to upgrade capacity. Build and implement clothes racks and hangars in all rooms. Organize bulk food purchase and implement required storage ability. More trees planted around compound. Set up a sick room, supply, teach basic first aid and OTC medicine usage. Build a Merry go Round (potential). Medical outreach project for the Bwase community as a precursor to a permanent clinic (potential). 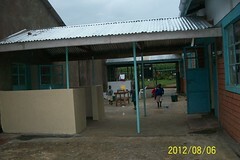 Add a powered pump, storage tank, and chlorinator to the well at Balowoli Primary School. Assistance for Promise Primary School. Project TBD. Assistance for Rock View School. Project to build desks, benches, and tables. Assistance for Teso, solar panel and charge controller for Godfrey, more Treasure devices. Evaluate future of chicken project. Welcome new kids, address physical living needs. Wisdom and guidance about expanding the home with 22 new kids. Wisdom during Management Topic meetings and discussions so we are God-honoring. Wisdom and guidance as we mentor and encourage the two schools we visit. That we are led into Evangelism and Community Outreach projects by the Holy Spirit. Safety and peace at the home. Health of the kids physically and spiritually, that they know the love of Christ Jesus. God’s will and peace in the national re-elections in Kenya. A small team of 3 of us will meet at Child Redeemed Mission (Formerly SOH, Stream of Hope) for mission trip #20 for Mission Servants to Africa and the 12th to Uganda. Ve’Neesha got a head start on Gary and I and has been there for a week already loving on the kids at CRM and in a village she visited a year ago. Gary and I leave Wednesday 9 August. Please pray for us. Here is a summary…..
Child mentoring, sharing with, and loving. Community serving and loving. Improve playground and install a steel swing set frame. Build steel soccer goal frames and install nets. Additional Security lighting installation around the compound. Move the well water tap closer to the kitchen. Complete the concrete work between the buildings for rain water flow. Replace valves on 2 water tanks. Review open items needed for adding 22 children to CRM. Water quality improvement project at the community school. Meet and plan to execute this project on the next trip. Management topics with Staff, Government, Hospital, Legal, and Accounting persons. Prepare and plan for the next trip in January. Visit two schools in the area that are sponsored by similar ministries, to encourage. Visit the Teso ministry. Leave 25 more audio Bibles. Safety and peace for Gary and Bob in Africa and for Kathy and Mary Lynn at home. God’s will and peace in the national elections in Kenya.